John Handley Bearings recently launched their new range of JHB Split Bearings at the annual BearingNet show in Warsaw, Poland. With the highest radial and axial capacities of ANY split bearing currently available the buzz around this new product, a collaboration with noted bearings manufacturer Bowman International, has been growing for months. 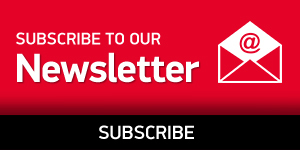 Now that it has finally been launched we can take an exclusive look at this exciting new product and consider what it means for the split bearings market. The split roller bearing was invented at the beginning of the 20th century and as the name would suggest is a bearing that is completely split to the shaft. Split bearings are mainly used in applications where replacing standard solid bearings requires expensive additional work, where the bearing location is trapped or where access is limited. Installation and inspection times are significantly less than solid bearings and they provides huge savings in production and maintenance. Split bearings are a mainstay for a wide range of demanding industries like the marine, mining and quarrying sectors. 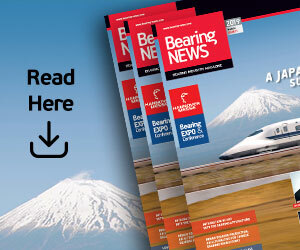 Much has already been written about the new JHB Split Bearing online and in the industry press. It is being positioned as “a revolution in design” and for good reason as the design of the split bearing has not really changed since its invention in 1907. 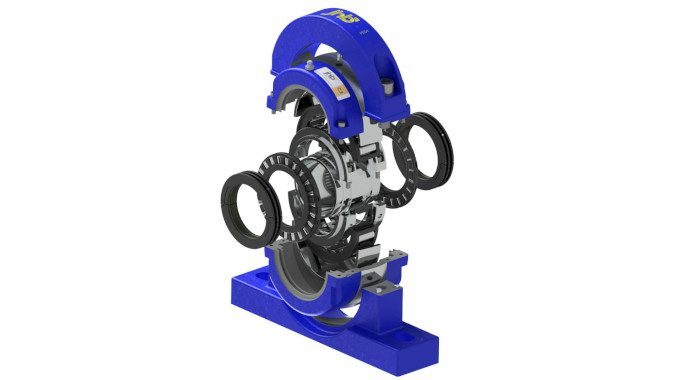 JHB and Bowman have redesigned the entire bearing around the radial and axial bearing cages unlocking previously impossible capacities. 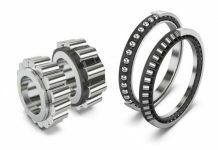 These new capacities allow JHB to replace the four separate series of existing split bearings with just one single series. Perhaps the most notable part of the JHB Split Bearing is the patent-pending Rollertrain cages which were recently “Highly Commended” at the prestigious TCT Innovation Awards. JHB & Bowman have developed a design that allows much closer spacing of the cylindrical rollers compared to traditional designs and in so doing increased the radial capacity by 70% and the axial capacity by an astounding 1000% – significantly higher than any other split bearing in the world. These incredible numbers are achieved through the fact that the radial and bi-directional axial loads are, for the very first time, handled independently. The loads are accommodated by three independent sets of rolling elements to handle three load directions. This opens up a brand new dimension which makes the JHB Split Bearing the first ever split bearing to allow calculation of an axial L-10 life. It is the use of a bi-directional axial cage that really makes the JHB Split Bearing a true innovation. By inserting an axial bearing either side of the free bearing it converts it into a fixed bearing which allows the axial capacity to be increased by ten times that of any existing split bearing and the calculation of the L-10 life. This enables a whole new dimension of design freedom for engineers that just was not possible until now. The potential in regards to design and flexibility that this new capacity offers is quite frankly mind-boggling. The JHB Split Bearing is the result of an extensive collaboration between various divisions within the Bowman Group. As a group that prides itself on innovation and progressive approaches, its no surprise that the JHB Split Bearing utilises additive manufacturing technologies within the bearing. Bowman Advanced Engineering, the technical wing of the group, was responsible for the design of the cages and seals with Bowman Additive Production, the group’s 3D printing division, responsible for the manufacture of said components. Being able to call upon the expertise and technical skill of experienced production and design engineers across different engineering disciplines have contributed to the JHB Split Bearing being a truly innovative and contemporary product. 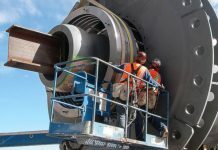 Increased capacities and new technologies aside for a moment, the list of benefits that the JHB Split Bearing offers over traditional bearings seems to be almost endless. It has been designed with ease of use, convenience, flexibility and customer service firmly at the forefront of priorities. JHB have invested heavily in stock and hold a large stock profile of sizes across the split bearings range– this is peace of mind for engineers who need to know that a supplier can deliver what they need when they need it. JHB have also committed to all stock being available on next-day delivery service within the UK. All components within the split bearing have been designed to be interchangeable between bearings within the same group, meaning that bearings can be stocked as component parts rather than built-up items, allowing distributors to maximize availability whilst minimising stock. As part of the Bowman Group customers will also be able to rely on full technical support from Bowman Advanced Engineering including 3D design, product support and site visits. This level of expert customer service is a real benefit to any engineer who might not be familiar with fitting/maintaining split bearings. So what about modifications? 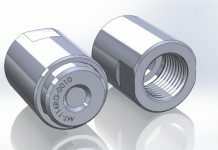 Not all applications are the same and there is never a one-size-fits-all solution; Bowman Advanced Engineering are able identify application requirements and carry out modifications to the core product easily as the JHB Split Bearing requires no tooling which makes small quantities extremely cost effective. The JHB Split Bearing is an important product for a number of reasons. Up until now there has been something of a monopoly on quality split bearings which has been held by a handful of large bearings companies. These companies offered less in the way of capacity and flexibility and engineers had little choice but to work within their parameters. The fact that JHB can now offer a significantly better bearing gives engineers the freedom of choice and the ability to work at higher capacities. Considering for a moment what this means for the split bearing market it is difficult to overestimate the potential disruption the JHB Split Bearing could cause. It does everything traditional split bearings do but it also adds value across the board making no compromises at any point. Adding value is the holy grail for engineering components and if a manufacturer can take an existing idea, add to it and make it more efficient then it is almost guaranteed to have a meaningful impact on the market. In closing, The JHB Split Bearing is quite simply a game changer. There is no other split bearing currently available that can match it in terms of capacity, flexibility, simplicity, innovation or customer support. The hype around the launch of the bearing is just the beginning. The JHB Split Bearing is dimensionally compatible with existing split bearing Pedastals to accommodate ease of conversion.